For those that have been around you know Sylvan Beach is a legendary Houston area triathlon and duathlon. We are honored to take it under our BCTS banner. We are keeping everything the same for the most part. But we are excited to announce the addition of the Olympic distance Tri and also we are moving the finish line arch to the edge of the ocean. So you finish through the sand, and straight into the water. We’ll be waiting for you with the best beach party your tri suit has ever seen! Any changes made to the race are done because we have to, out of safety for our participants. These issues, when they do occur, arise after the race has been planned. We are triathletes too and do everything to create a better, safer, more enjoyable experience for all of you. We are proud to have Home 2 Suites by HILTON La Porte as our official hotel sponsor for Sylvan Beach Tri & Du! They’re conveniently located at 1251 S. 13th St. La Porte, TX. 77571. Find out where you can park and where you can't. Parking will be at La Porte High School, 301 E. Fairmont Parkway, La Porte, Texas 77571. Cars will not be permitted in Sylvan Beach Park for any reason. It is a quarter mile walk to the beach park from the high school. Race Day Packet Pickup: For an extra fee (THIS SELECTION CAN BE MADE DURING REGISTRATION AND UP UNTIL THE FIRST PACKET PICK UP DATE), you can pick up your packet at the race site from 5:30 a.m. to 6:30 a.m. race day near the chip timing tent. You MUST BRING YOUR PHOTO ID. YOU MUST HAVE A USAT MEMBERSHIP TO PARTICIPATE IN THIS USAT EVENT. YOU CAN PURCHASE AN ANNUAL OR ONE DAY USAT MEMBERSHIP during the registration process or ONLINE at www.usatriathlon.org. We do not need to see your USAT Annual License (if you have one). When you registered it either confirmed the validity of your USAT Annual License, charged you for a new one, or charged you for a 1-day license. Whatever the case, all athletes have been confirmed as far as USAT status goes once registered. You’ll see the option to choose VIP when you get to registering online. Only available to the first 150 that sign up. Duathlon Start: The Duathlon will begin with a mass start run. You will take off from the edge of the beach near the transition area. You will finish on the beach just the same as the triathlon finish. Then as soon as you pass under the arch, take a few more strides straight into the ocean! Rally your teammates and mark your team calendar for the Tri Team Challenge! The Tri Team Challenge invites clubs to come together and compete to win some terrific prizes, including $500 cash to the first place team. Let’s see what your team can do against the best teams in town in a fun, competitive environment where you also have the opportunity to raise money for your team and a charity of your team’s choice as well! 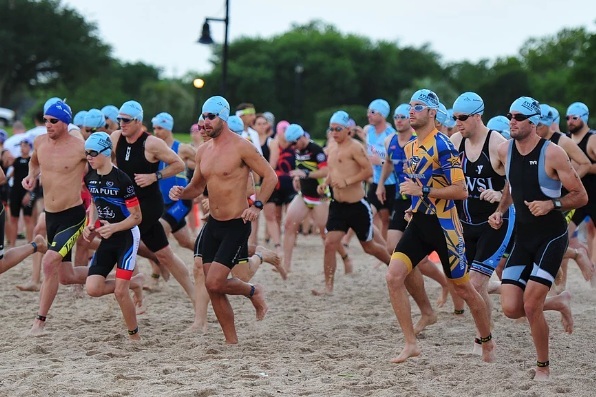 • 5 free entries into the following year’s Sylvan Beach Triathlon to defend your title. • 3 free entries into the following year’s Sylvan Beach Triathlon. • 2 free entries into the following year’s Sylvan Beach Triathlon. Each Team must enter with at least 8 members to qualify as an official team. Scoring is detailed below, but you will need at least one (1) male and one (1) female in each distance triathlon. Each Team must designate a Team Captain to be the Team’s Contact person. The Team Captain is responsible to submit a Team roster to us no later than June 1 week before the race. NO CHANGES ARE PERMITTED TO TEAM ROSTERS AFTER THIS DATE. SUBSTITUTIONS MAY BE MADE FOR INJURY OR OTHER UNFORSEEN CIRCUMSTANCES AT THE DISCRETION OF EVENT MANAGEMENT. The Team with the fastest overall Team Time wins! The Team with the second fastest time will be awarded 2nd place, and the Team with the third fastest time will be awarded 3rd place. The Swim begins with a triangle out from a sprint off the soft sandy beach. After T.A. in the grass field, head off on the 15 mile bike lap. Followed by a nice out and back through the neighborhood of beach houses. Olympic just does two of each lap before going onto the next leg. Your bike turn to begin your 2nd bike lap will be before T.A. turning left onto S. Broadway. The Duathlon starts with a 2 mile out and back run; followed by a full 15 mile bike lap; then finishes with a 3 mile out and back run. For issues with your results, contact No Limits Timing. The timing chips are not disposable. We will take them at the finish line and recycle the chip and save the strap for the next event. If by chance you pickup your packet but do not end up racing you may mail your chip & strap to No Limits Timing - 3050 Knolin Dr, Bossier City, LA 71112.